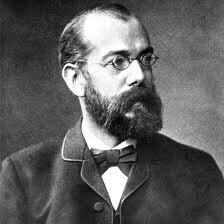 Robert Koch was born on December 11, 1843, at Clausthal in the Upper Harz Mountains. The son of a mining engineer, he astounded his parents at the age of five by telling them that he had, with the aid of the newspapers, taught himself to read, a feat which foreshadowed the intelligence and methodical persistence which were to be so characteristic of him in later life. He attended the local high school («Gymnasium») and there showed an interest in biology and, like his father, a strong urge to travel. In 1862 Koch went to the University of Göttingen to study medicine. Here the Professor of Anatomy was Jacob Henle and Koch was, no doubt, influenced by Henle's view, published in 1840, that infectious diseases were caused by living, parasitic organisms. After taking his M.D. degree in 1866, Koch went to Berlin for six months of chemical study and there came under the influence of Virchow. In 1867 he settled, after a period as Assistant in the General Hospital at Hamburg, in general practice, first at Langenhagen and soon after, in 1869, at Rackwitz, in the Province of Posen. Here he passed his District Medical Officer's Examination. In 1870 he volunteered for service in the Franco-Prussian war and from 1872 to 1880 he was District Medical Officer for Wollstein. It was here that he carried out the epoch-making researches which placed him at one step in the front rank of scientific workers. Anthrax was, at that time, prevalent among the farm animals in the Wollstein district and Koch, although he had no scientific equipment and was cut off entirely from libraries and contact with other scientific workers, embarked, in spite of the demands made on him by his busy practice, on a study of this disease. His laboratory was the 4-roomed flat that was his home, and his equipment, apart from the microscope given to him by his wife, he provided for himself. Earlier the anthrax bacillus had been discovered by Pollender, Rayer and Davaine, and Koch set himself to prove scientifically that this bacillus is, in fact, the cause of the disease. He inoculated mice, by means of home-made slivers of wood, with anthrax bacilli taken from the spleens of farm animals that had died of anthrax, and found that these mice were all killed by the bacilli, whereas mice inoculated at the same time with blood from the spleens of healthy animals did not suffer from the disease. This confirmed the work of others who had shown that the disease can be transmitted by means of the blood of animals suffering from anthrax. But this did not satisfy Koch. He also wanted to know whether anthrax bacilli that had never been in contact with any kind of animal could cause the disease. To solve this problem he obtained pure cultures of the bacilli by growing them on the aqueous humour of the ox's eye. By studying, drawing and photographing these cultures, Koch recorded the multiplication of the bacilli and noted that, when conditions are unfavourable to them, they produce inside themselves rounded spores which can resist adverse conditions, especially lack of oxygen and that, when suitable conditions of life are restored, the spores give rise to bacilli again. Koch grew the bacilli for several generations in these pure cultures and showed that, although they had had no contact with any kind of animal, they could still cause anthrax. The results of this painstaking work were demonstrated by Koch to Ferdinand Cohn, Professor of Botany at the University of Breslau, who called a meeting of his colleagues to witness this demonstration, among whom was Professor Cohnheim, Professor of Pathological Anatomy. Both Cohn and Cohnheim were deeply impressed by Koch's work and when Cohn, in 1876, published Koch's work in the botanical journal of which he was the editor, Koch immediately became famous. He continued, nevertheless, to work at Wollstein for a further four years and during this period he improved his methods of fixing, staining and photographing bacteria and did further important work on the study of diseases caused by bacterial infections of wounds, publishing his results in 1878. In this work he provided, as he had done with anthrax, a practical and scientific basis for the control of these infections. Koch was still, however, without adequate quarters or conditions for his work and it was not until 1880, when he was appointed a member of the «Reichs-Gesundheitsamt» (Imperial Health Bureau) in Berlin, that he was provided, first with a narrow, inadequate room, and later with a better laboratory, in which he could work with Loeffler, Gaffky and others, as his assistants. Here Koch continued to refine the bacteriological methods he had used in Wollstein. He invented new methods - «Reinkulturen» - of cultivating pure cultures of bacteria on solid media such as potato, and on agar kept in the special kind of flat dish invented by his colleague Petri, which is still in common use. He also developed new methods of staining bacteria which made them more easily visible and helped to identify them. The result of all this work was the introduction of methods by which pathogenic bacteria could be simply and easily obtained in pure culture, free from other organisms and by which they could be detected and identified. Koch also laid down the conditions, known as Koch's postulates, which must be satisfied before it can be accepted that particular bacteria cause particular diseases. Some two years after his arrival in Berlin Koch discovered the tubercle bacillus and also a method of growing it in pure culture. In 1882 he published his classical work on this bacillus. He was still busy with work on tuberculosis when he was sent, in 1883, to Egypt as Leader of the German Cholera Commission, to investigate an outbreak of cholera in that country. Here he discovered the vibrio that causes cholera and brought back pure cultures of it to Germany. He also studied cholera in India. On the basis of his knowledge of the biology and mode of distribution of the cholera vibrio, Koch formulated rules for the control of epidemics of cholera which were approved by the Great Powers in Dresden in 1893 and formed the basis of the methods of control which are still used today. His work on cholera, for which a Prize of 100,000 German Marks was awarded to him, also had an important influence on plans for the conservation of water supplies. In 1885 Koch was appointed Professor of Hygiene in the University of Berlin and Director of the newly established Institute of Hygiene in the University there. In 1890 he was appointed Surgeon General (Generalarzt) Class I and Freeman of the City of Berlin. In 1891 he became an Honorary Professor of the Medical Faculty of Berlin and Director of the new Institute for Infectious Diseases, where he was fortunate to have among his colleagues, such men as Ehrlich, von Behring and Kitasato, who themselves made great discoveries. During this period Koch returned to his work on tuberculosis. He sought to arrest the disease by means of a preparation, which he called tuberculin, made from cultures of tubercle bacilli. He made two preparations of this kind called the old and the new tuberculin respectively, and his first communication on the old tuberculin aroused considerable controversy. Unfortunately, the healing power that Koch claimed for this preparation was greatly exaggerated and, because hopes raised by it were not fulfilled, opinion went against it and against Koch. The new tuberculin was announced by Koch in 1896 and the curative value of this also was disappointing; but it led, nevertheless, to the discovery of substances of diagnostic value. While this work on tuberculin was going on, his colleagues at the Institute for Infectious Diseases, von Behring, Ehrlich and Kitasato, carried out and published their epoch-making work on the immunology of diphtheria (see the biographies of Ehrlich and von Behring). In 1896 Koch went to South Africa to study the origin of rinderpest and although he did not identify the cause of this disease, he succeeded in limiting the outbreak of it by injection into healthy farm-stock of bile taken from the gall bladders of infected animals. Then followed work in India and Africa on malaria, blackwater fever, surra of cattle and horses and plague, and the publication of his observations on these diseases in 1898. Soon after his return to Germany he was sent to Italy and the tropics where he confirmed the work of Sir Ronald Ross in malaria and did useful work on the aetiology of the different forms of malaria and their control with quinine. It was during these later years of his life that Koch came to the conclusion that the bacilli that caused human and bovine tuberculosis are not identical and his statement of this view at the International Medical Congress on Tuberculosis in London in 1901 caused much controversy and opposition; but it is now known that Koch's view was the right one. His work on typhus led to the idea, then a new one, that this disease is transmitted much more often from man to man than from drinking water and this led to new control measures. In December, 1904, Koch was sent to German East Africa to study East Coast fever of cattle and he made important observations, not only on this disease, but also on pathogenic species of Babesia and Trypanosoma and on tickborne spirochaetosis, continuing his work on these organisms when he returned home. Koch was the recipient of many prizes and medals, honorary doctorates of the Universities of Heidelberg and Bologna, honorary citizenships of Berlin, Wollstein and his native Clausthal, and honorary memberships of learned societies and academies in Berlin, Vienna, Posen, Perugia, Naples and New York. He was awarded the German Order of the Crown, the Grand Cross of the German Order of the Red Eagle (the first time this high distinction was awarded a medical man), and Orders from Russia and Turkey. Long after his death, he was posthumously honoured by memorials and in other ways in several countries. In 1905 he was awarded the Nobel Prize for Physiology or Medicine. In 1906, he returned to Central Africa to work on the control of human trypanosomiasis, and there he reported that atoxyl is as effective against this disease as quinine is against malaria. Thereafter Koch continued his experimental work on bacteriology and serology. In 1866 Koch married Emmy Fraats. She bore him his only child, Gertrud (b. 1865), who became the wife of Dr. E. Pfuhl. In 1893 Koch married Hedwig Freiberg. Dr. Koch died on May 27, 1910, in Baden-Baden.